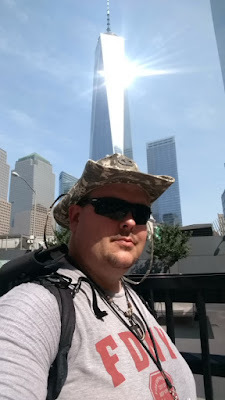 In Part 1, I listed a whole bunch of facts, and figures, not to bore anyone, because it is important to know how the World Trade Center came to be, and what events happened during its lifetime. All very important information, but September 11th, 2001, is not about facts and figures to me. Don’t get me wrong, there is a lot of information that helps us establish what happened at what times, and how many people were ultimately affected. I will get to that, but first is my account of what September 11th was like for me. A story, I have never told before to anyone except my Therapist, and that wasn’t until last year. In 2001, I was 22 years old, and a Firefighter/ EMT. I had started that career, first, as an EMT, when I was just 16 years old. Like so many others, I was a volunteer, though there were a few years where I was a Professional EMT in Hartford, for both Aetna, and AMR Ambulance Services. Hartford was extremely dangerous, and it gave me an opportunity to see the more severe trauma cases, where as a volunteer, in the suburbs, violent crime & trauma wasn’t as common. Sure, I had been to some bad Motor Vehicle Accidents, and Fires as a volunteer, but Hartford was another animal altogether. However, looking back, with the exception of one case, all the major “disasters” I had been to, I had always gone voluntarily. Sometimes, traveling out of state to end up as an “inside spectator”. Meaning, I was there if I was needed, but typically not called upon. Still, it was always difficult if there was a Line of Duty death, or death, or multiple deaths, of civilians. 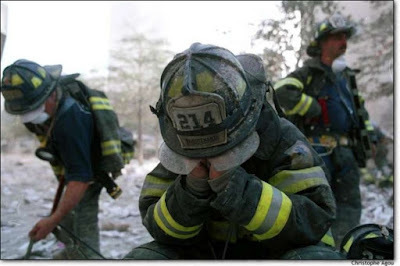 I’ve been to more Firefighter funerals than I care to remember, but nothing, and I do mean nothing, had ever prepared me for what I came upon in New York. I didn’t know how I would respond to working on this project. I suffer from PTSD, from being there that day, and the days that followed, and I’ve always been very emotional any time the subject comes up. There came a time a while back when I was ready to begin working on how I felt, and this is the culmination of that work. The personal stories of the Rescue Workers, Civilian Workers, Families of those that perished, and Survivors, are all part of history, and it’s important that these stories are told, and heard. Even mine. Tuesday, September 11th, 2001, started off cold; It was in the upper 40’s, lower 50’s. I was working for a Marketing company, and I was on the road a lot, and free to make my own schedule. I was also a fairly active Volunteer Firefighter, & EMT; I had graduated the Fire Academy in January 1999, but as I mentioned, I’d been involved with EMS & the Fire Service since I was 16. I had also been involved with the Police Explorers previous to that. So, emergencies and disasters (To a degree) were something I was very familiar with. I typically started a workday off early; Around 7 am each day. Not typical of the time, I did have a cell phone- for work, but my fiancé, Nikki, was 7 months pregnant with our daughter, so it was important I could be reached. Shortly before 9 am, of all people to call me, my Mother called. While it’s almost impossible to remember the exact conversation, I sure do remember how it could be summed up; The world was coming to an end. I was working with a customer of mine, so I hadn’t seen the news, but when I went to look at a TV, it was just in time to see the second plane hit. The workday had just come to an end. 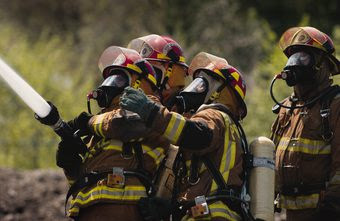 As a Volunteer Firefighter, there is no difference between a volunteer service, and a paid one. There was a chain of command to follow, especially if you were about to completely go off the reservation, even if it was justifiable. For such an incident of that magnitude, I really thought I’d get an, “Oh I completely understand, you need to go down there!” What I actually got was, “Absolutely not!” It wasn’t the kind of conversation where you questioned why not, or even bargain it down to, “Can we talk about this?” No, was no. 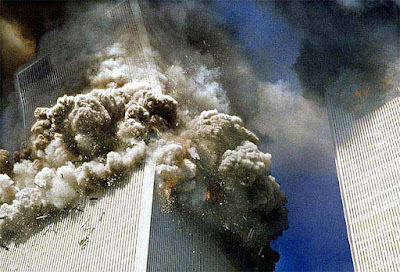 Given the gravity of the situation, compounded by the events that just kept on rolling in; The Pentagon gets hit, The South Tower collapses, Flight 93 crashes, and on and; on, as we all know. As I watched events unfold, it boiled down to the point, that I knew I was at a reasonable distance from New York, and yes, as my Mom said, the world sure looked like it was coming to an end. Also, as a Volunteer, especially in Connecticut, my heroes were in FDNY, Boston, and Hartford. I routinely visited different Firehouses in New York, and Boston, and even rode along with a few companies. 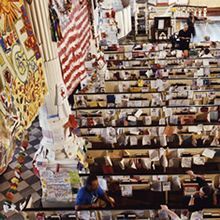 One firehouse I used to love visiting, was Engine 10/ Ladder 10 in New York- The first company to the World Trade Center. This was because the Firehouse skirted the Trade Center. 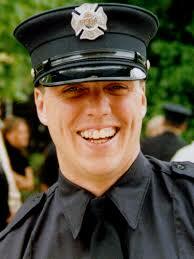 And I knew one guy there fairly well, Jeffery Olsen, a young Firefighter like myself. I had a face to pin on these disasters. These attacks on our Country. I came to a decision quickly, and I still question if it was right; I, was going anyway. Maybe on any other day, they could have stopped me. On that day, however, I was told, “Ok, but hang for a minute” That “Hang On” turned out to be a waiver I had to sign, releasing the Department from any responsibility. Meaning, if I got hurt, in any way, it was on me. It also meant, if I damaged my gear (Which belonged to the Department), it was also my responsibility. It was all justifiable to me, and I’ve asked myself if I’d do it again if I had the chance. I would. Because I don’t think I could’ve lived with knowing there was a way I could go, and didn’t. There was no traffic into New York, and I’d heard the train was taking Emergency Service Workers into the City. It was strange, because it was a train of what seemed like all Firefighters and at each stop even more got on. Speculation was the word of the day. No one had a clue of what was waiting for us. In the City, there was a feeling of importance that we get there, but we all knew if we worked like hell to get there by walking 50 or so blocks, we’d be useless when we arrived. The Subway worked to a certain point, because of what I figured was debris in the tubes. The first, and what turned out to be one of the most important buildings to me, was St. Paul’s Cathedral. Not that I was looking for a place to pray, but it was the strangest…. Miracle(?) I’d ever seen. When the World Trade Center collapsed, the damage wasn’t just contained to the immediate area. There was damage to all sorts of buildings, cars & trucks, street signs, windows, etc. Thus was the case with St. Paul’s, though I expect some higher power was at work. Right on Broadway, St. Paul’s stood smack in the front of the North Tower. Everything around it, in one form or another, had some type of damage. St. Paul’s, however, was covered in, what it appeared like, a soft gray snow. About a foot deep. Built in the Mid- 1700’s, as a famous poem goes, “It stood. Not a window broken. 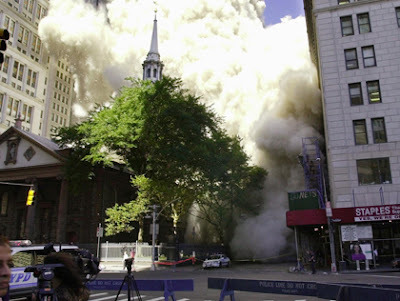 Not a stone dislodged…” Where it seemed every other building around it, had some damage, St. Paul’s had none. It is believed by many that it was a miracle, and I am one who subscribes to that theory. St. Paul’s, however, played a part in my experience, as it did for many others. There was a fence outside the perimeter of the Church. An old, wrought iron fence, with pointed spires on top. On the top of the fence, there were shoes, & boots. A lot of them, going down the front. Like everything else that day, it didn’t make much sense. After checking in quickly, which at that time, wasn’t much of a process, as I thought it would, I followed the path of destruction to where there was a frantic search for survivors. As it turned out, the lesser known, Building 5, was going to be where I’d be for the time I was there. I say lesser known because even as I talked to different people just this year, a lot didn’t even know there was a Building 5. Just to be clear, there were 7 total buildings. Everyone knows 1 & 2 (The North & SouthTowers, respectively), Building 5 was to the Northeast corner of #1. 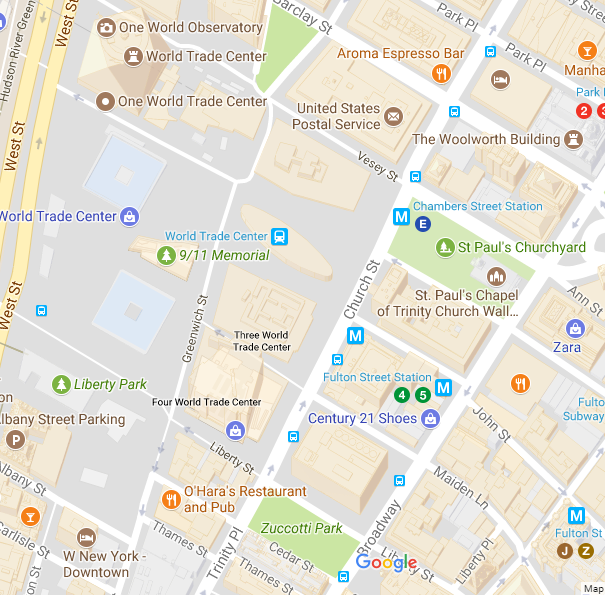 Building 7, a building that became infamous, was Northwest of #5, and more or less, where the new 1 World Trade stands now. I won’t do them any honor by mentioning their names, but many groups claim that Building 7 collapsed because “The Government” demolished it, by controlled detonations. My answer to them, and everyone is no one really knows what a building collapsing, actually sounds like. Many different people can take away different accounts of what they see and hear, because, as sprawled out as the whole site was, there were people everywhere. In Building 5, or Building 6 (Which is behind Building 5; Across from #7), anyone in those buildings, or around the buildings, would have been the closest to it. Being in Building 5, it was a terrifying roar, out of the realm of my imagination. And let’s be honest, on that day, of all others, everyone had thought of collapsing buildings that day. There were 3 options as I saw it while I was there, if you’re going to be there more than oneday, you’ll need a place to sleep. There was a hotel, which you would pay for if the hotel wouldn’t accept any money. Many of them were very accommodating. There was a Firehouse, which was Engine 10 after they dug it out. And there was St. Paul’s. The Firehouse was noisy and smelled. The hotel was too far away. St. Paul’s was close and strangely devoid of the smell of burning building. I think they have their own “House Blend” for incense because when we came back this year, it smelled the same. 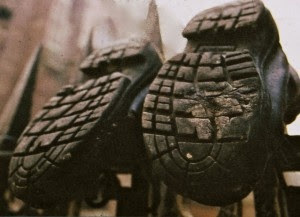 But as the days went on, the shoes on the fence never went anywhere, as “Missing Persons” signs, began to cover the fence. The shoes it turned out, were Firefighters shoes, as they stopped to put on their Turnout gear. I left New York, on the 14th of September, drained, physically, mentally, & spiritually. Most of all the last one. I didn’t find anyone. On any other day, that would have been something to have a party about. After all, the Fire Service is based on saving life from disasters. An empty building indicates that everyone survived. Not on that day, or any day after. 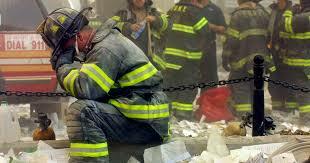 Ultimately, 20 Survivors were pulled from the rubble for the 24 hours after September 11th. Though that all 20 were pulled in 24 hours, the frantic search for life continued on for days after that. It was the worst attack on America in generations, and it brought out the best response of love and caring that I have ever seen. 2,753 people died at the World Trade Center. Of those who perished during the initial attacks and the subsequent collapses of the towers, 343 were New York City firefighters, 23 were New York City police officers and 37 were officers at the Port Authority. Ceremony, and we had the full expectation that we would go to New York, talk to victim’s families, survivors, Rescue Workers, etc. We succeeded in none of that. The journey which put us there for 7 am, began promptly at 1 am. I hadn’t been to New York since 2008 when only the foundation of 1 World Trade was built, and the Memorial was a 70-foot hole in the ground. When we climbed the stairs on to Fulton Street, it was like walking into a place I had never been. The streets seemed to have been manipulated. I did check, and they did indeed move entire streets. 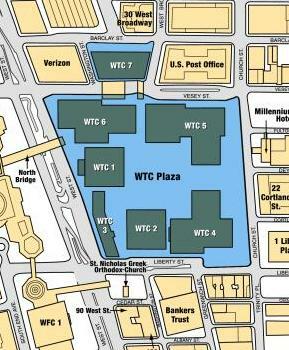 The position of the Memorial Pools mark where the original Trade Center stood, but everything around that was changed. Things were evidently changed so as to make it look as little like the past as possible. Inasmuch as to remember, yet move on. Security was obviously high, to levels I had never seen there in the years leading up to laying the foundation of 1 World Trade. The barriers had barriers. There was Police, and Coast Guard in the Harbor, & Rivers. Police Helicopters and Military Blackhawks were visibly armed. Police carried Assault Rifles and wore Helmets. The feeling was that there was a threat, for the amount security present. 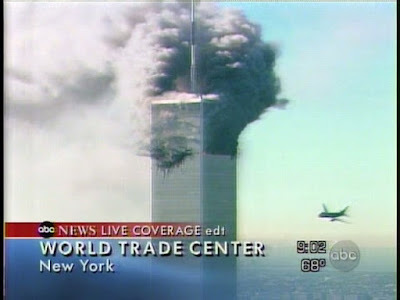 At 8:46 am, the exact moment American Airlines Flight 11 hit the North Tower, a bell tolled, and a moment of silence was observed. Then, two family members of victims were paired up, and each pair read off the names of those killed that day, as well as the names of the 6 people killed in the 1993 bombing. The list was alphabetized by last name, and methodically starting at “A”, and ending at “Z”, each pair of readers read the names, and each reader was able to read their loved one's name and tell some short memories, and some used the moment to tell their loved one something that happened since they had passed. themselves. It’s also a cemetery. As of August 2017, 1,641 (or 60%) of 2,753 WTC victims' remains have been positively identified, according to the medical examiner's office. Which means that 1,113 people have never been identified, and their families were never given remains to bury. 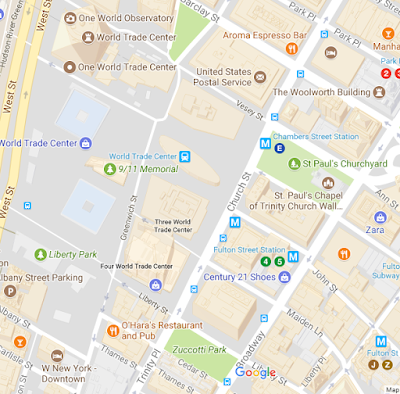 The remains of victims that were never positively identified, are stored at a repository underneath the World Trade Center site, adjacent to the 9/11 Memorial Museum. The Memorial & Museum are a place for the families of the missing to go because that’s where their loved one took their last breath. Until 2008, I had gone to ceremonies previously, where thousands upon thousands came to remember. This year I was shocked to see much less than a thousand. I stopped going in 2008 because it was just too difficult. I also was not dealing with my thoughts and feelings properly, and it wasn’t until 2011, that I started to see a value in remembering. I know now, that I never dealt with my emotions on the subject, going all the way back to 2001. In December 2001, it was then where I didn’t see a point in continuing in the Fire Service, and quit, never to return again. In 2003, my EMT Certification lapsed, never to be renewed. I stopped corresponding with men I knew from the Fire Service, and New York. Back then, I had an old school way of thinking, thinking that the way to deal with it, was to not deal with it. I spent 10 years not dealing with it, and the past 6 years working on the “stuff” I didn’t deal with. Here’s a free PSA for the Mental Health Industry: If you go through something traumatic, please talk to someone. Going back there this year, to write for the Insider, I was detached in a way. I had a history with this place, but I’d spent so much time recently researching different facts, and stories, and watching, it seems, every documentary on 9/11, and the World Trade Center. That, and I hadn’t been back since 2008, and since then, it seemed like developers made a concentrated effort to not make the area appear the same as it had. If that was the goal, they achieved it. In part 3, I’m going to dive into the motives of designers of the Memorial & Museum, and the new World Trade Center buildings. I want to thank Bill Boylan, the Editor In Chief of the Middletown Insider, for entertaining my aspirations, and thank you to those of you who supported us. I hope to have Part 3 by the end of this week.